Following several deals, the future seems bright for this Internet of Things leader. Will these risks ruin the rosy forecast? Otherwise known as the thermostat, the "electric tele-thermoscope" was patented by Warren Johnson in 1883. Source: Johnson Controls. Sure, regulating a building's heating and cooling systems through wireless sensors seems futuristic, but Johnson Controls (NYSE:JCI) has been doing it for more than 130 years. Nowadays, with the Internet of Things, the company is addressing fire, security, and numerous other systems besides heating and cooling. As a market leader with a rich history, the company certainly warrants close examination. So let's dig into the company's 10-K and examine three of the most substantial risks threatening the company's success. From the 10-K: "Conditions in the commercial and residential new construction markets may adversely affect our results of operations." With management spinning off the automotive segment, the building efficiency segment will largely be responsible for the company's growth. By way of its numerous HVAC brands and building automation systems, Johnson Controls relies on growth in the commercial and residential new construction markets. Without growth in these markets, the company may take on various costs and impairment charges. It also misses an opportunity to secure long-term customers. The relationship between Johnson Controls and the new building operators doesn't end upon the selling of its HVAC equipment. That equipment, at some point, will require servicing. Therefore, the earlier Johnson Controls gets its equipment into a building, the more value it yields from the relationship. And according to the company, those relationships are quite successful. In its 10-K, management states that "customer relationships often span entire building lifecycles." 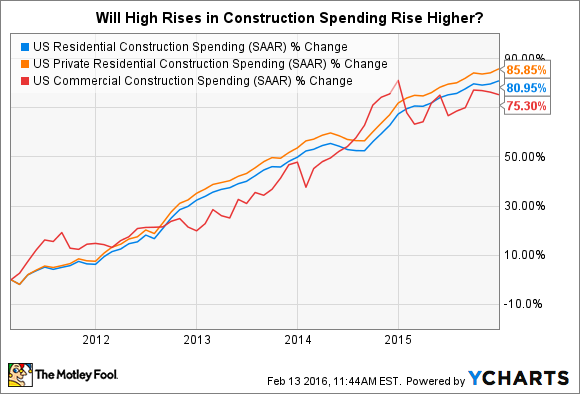 Since the Great Recession, the new construction markets have been growing; however, the health of the current economic environment is increasingly uncertain, and this may adversely effect new construction spending. In its annual stress test, the Federal Reserve explored a scenario that included "a moderate recession and mild deflation." Moving forward, investors should monitor the geographical mix in the building efficiency segment's net sales to see if it's growing revenue from Asia and other global markets. The company has succeeded in reducing its reliance on North America -- net sales have steadily dropped from 43.5% of the segment's sales in 2013 to 42.3% in 2015, and this trend should continue. Growth in the North America segment is, of course, welcome, but if North America's growth far outpaces that of other regions, a red flag should go up. "We may be unable to complete or integrate acquisitions or joint ventures effectively, which may adversely affect our growth, profitability, and results of operations." In addition to its reliance on new construction, the company is also counting on a successful joint venture with Hitachi and merger with Tyco International (NYSE:TYC). The risk, herein, is that should the joint venture and merger produce only tepid results, the company's growth and profitability will suffer. A failed joint venture with Hitachi would mean two lost opportunities: gaining market share in Asia and strengthening its position in the variable refrigerant flow market in North America. On its Q1 2016 earnings call, management forecasted that Hitachi will contribute $2.75 billion in revenue to the building efficiency segment for fiscal 2016; however, this is a downward revision from the $3 billion it had initially forecast. And as expected, the integration has diluted margins. Management is forecasting segment margins to fall between 8.1% and 8.3% in fiscal 2016 -- down 80 to 100 basis points (or up 30 basis points, ex-Hitachi). Increased revenue from Asia as well as improved margins in the building efficiency segment would raise green flags. However, if these results aren't realized, the company's ability to maintain growth in the segment may be seriously compromised and would certainly be cause for concern. Planned to close before the end of fiscal 2016, the Tyco merger is expected to cause Johnson Controls to gain ground, geographically, in the European market. It will also increase the company's various "smart" products and services. Like Hitachi, failure to successfully integrate with Tyco could greatly compromise profitability as well as growth. Image source: Johnson Controls investor presentation. Investors should look for top-line growth as an indication of the deal's success. Furthermore, management expects $500 million in operating synergies to be realized within three years of the close of the deal. Should margins stagnate or shrink, it would suggest that management has failed to successfully execute the integration and a valuable opportunity has fallen by the wayside. "We may be unable to achieve some or all of the benefits that we expect to achieve from the spin-off." The spin-off of the automotive seating business into Adient is a major step in the company's transformation and represents a fair degree of risk. Management notes that should the spin-off costs spin out of control, either Johnson Controls or Adient "could suffer a material adverse effect on its business, financial condition, results of operations, and cash flows." Management estimates separation costs to fall between $400 million and $600 million in fiscal 2016. What should investors look for? The details of the new entity aren't clear yet. Specific financial information about Adient should be released in late March or early April, and management expects to complete the spinoff in October. There are a few figures to keep an eye on, though. For one, look for the proceeds Johnson Controls gains after the spinoff -- management expects between $2.5 billion and $3.5 billion. Also, in a recent presentation, management forecast Adient's operating margin to improve 200 basis points and EPS to improve by double digits in the mid-term. Failure to realize these estimates may suggest deeper woes for the company and should motivate investors to take a deeper look. Spinning off the automotive side of the business, Johnson Controls is returning its focus to what it knows best -- to what it's been doing for over a century -- improving building efficiency. Even though this and other risks exist, interested investors shouldn't shy away -- just be attentive. After all, these moves may help the company last another hundred years.